You can only get the most out of an RV if you have a nice set of batteries to power the vehicle facilities. Pretty much everything on your RV requires a stable supply of electricity to work therefore your batteries choice is important. When it comes to RV batteries, deep cycle battery proves to be among the most popular types to use. Yet with a huge number of brands and models around, how can you find the best RV deep cycle battery? Well if you are inexperienced in the field and could use some recommendations, this article will be of use to you. With people preferences vary a lot from one to the other, there is hardly one product that can satisfy everyone. The best battery to someone else might perform less than ideal in your case. As a result, it’s essential to make a comprehensive comparison between products to decide what works out for you. Should you buy without thinking ahead, the purchase could cost dearly and offer very little in return. To ensure your investment is well-spent money, you must make a wise decision by researching thoroughly all available options. 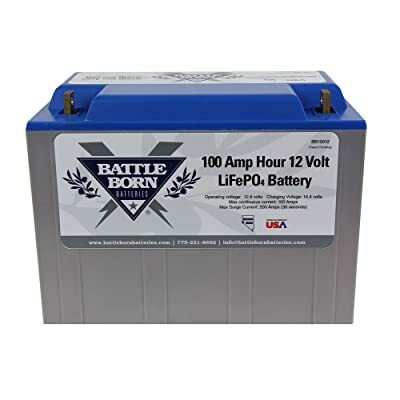 One of the lightest batteries around, the 100Ah 12V LiFePO4 Deep Cycle Battery from Battle Born Batteries is a compact product. Quality built, it is able to last between 3,000 and 5,000 charge cycles. After 3,000 cycles, you are still capable of charging the battery up to 75 – 80% of the total capacity. The continuous current of this battery is 100 Amp while its surge current reaches 200 Amp. For bulk charging, the acceptable charging voltage is around 14.4 – 14.6V. Given the limited profile and lightweight, the battery is rather easy to handle. Made from non-toxic materials, the 100Ah 12V LiFePO4 Deep Cycle Battery is a sustainable green energy battery. With a built-in Battery Management System, the battery is well protected against low and high voltages charging. As an efficient lithium-ion design, it’s a suitable replacement for traditional lead-acid batteries. The general handling is relatively simple and no need for sophisticated maintenance. You don’t have to get new hardware to install the battery, simply get the old one out and gently drop it in. Extended battery life and low maintenance fee, the Trojan 6-Volt T-105 225Ah Deep Cycle Flooded Battery is great for solar RV. It can discharge up to 80% of total capacity yet its cells remain undamaged. The lifetime of the battery ranges from 800 to 1,200 charge cycle which is fairly decent given its capacity. It provides a generous current of 11.25A for 20 hours straight before the charge is fully depleted. For off the grid occasions, Trojan T-105 is a nice way to power the RV appliances and electronic devices. Base on the storage temperature, the drain rate of the Trojan T-105 is approximately 5 – 15 % a month. This makes it greatly appreciated by long-time RVers, especially in the colder months of the year. It utilizes advanced Trojan’s T2 Technology that enhances the battery capacity and general operating power for better performances. The associated price tag is quite reasonable as well, it’s a comfortable match to most people wallet. 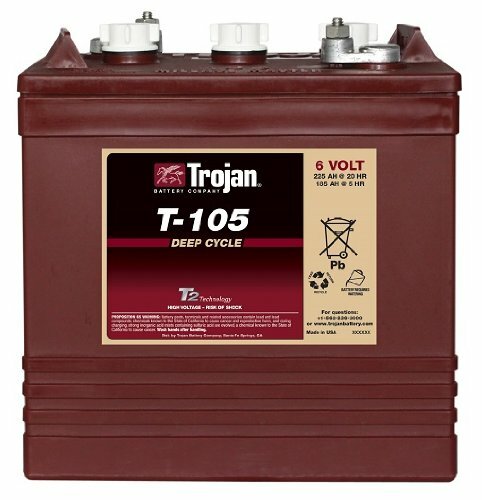 As a whole, Trojan T-105 is a nice all around battery for your RV. 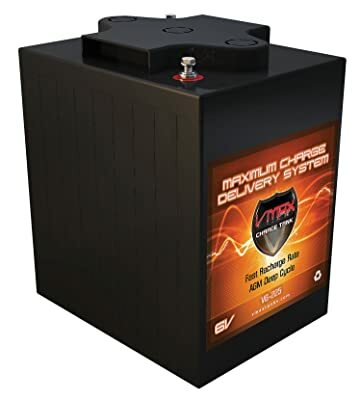 If all you need is a deep cycle battery for dry camping, the V6-225 of VMAXTANKS will not let you down. It possesses unique plates and high-end separators which offer a competitive performance compared to other products. The drain rate in storage condition is quite low too, you only have to check it once in a while. Using quality components, the battery will function perfectly for a decade without failing. While a flooded lead-acid battery is acceptable, a set of six V6-225 AGM batteries is excellent to power most RV electric appliances. V6-225 is a sealed design with no maintenance requirement across its lifespan so it’s safe and convenient to use. Other than occasional cleaning and tightening, you can use the battery completely worry-free. The battery cannot be spilled, it won’t release toxic fume in operation as well. Except the fact that it is rather heavy, the V6-225 battery shall be a nice purchase. If needed, you could connect six of them together in a parallel configuration to achieve an impressive 12 V battery bank of 675Ah. Of which, 500Ah is available at your disposal. 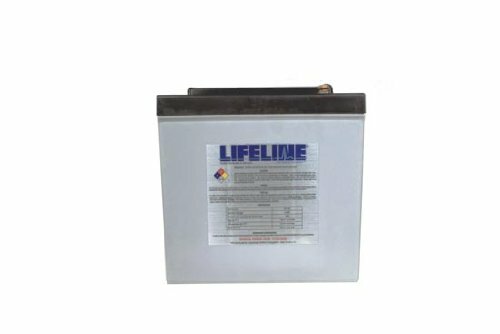 A product of Lifeline, the GPL-4CT is a high charge cycle battery which provides extended running times for your RV facilities. If you truly want to get comfortable inside an RV, this is the battery you should use. Couples with great resistance toward vibration, the battery high power efficiency means you never have to worry too much. The battery components are made from top of the line materials with strict requirements to ensure customer satisfaction. A proof of the manufacturer confidence in their products quality is the 5-year warranty. For a strong and dependable RV energy supply, you won’t go wrong with the Lifeline GPL-4CT. The battery performance is able to match private and industrial applications alike. It’s 100% leak proof, you and your RV are not in any kind of danger while handling the GPL-4CT battery. Its drain rate is fairly low and the battery won’t emit toxic gas in a recharge so it’s effective design. The battery doesn’t require a water refill through its life which makes the GPL-4CT easy to use and take care of. 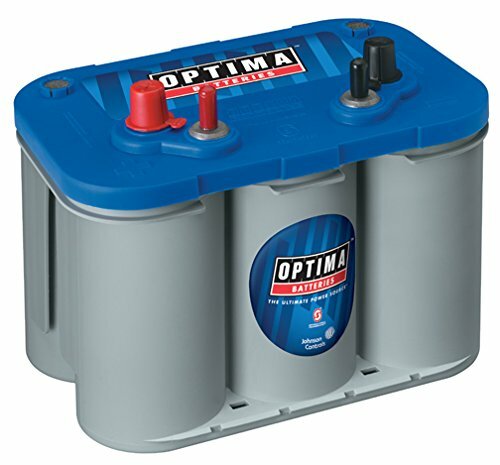 Created as a dual purpose battery, the 8016-103-FFP D34 of Optima Batteries is compatible to a variety of applications. One of the interesting features of the battery is its Cold Cranking Ampere, commonly called as CCA. A CCA of 750 Ah indicates that the 8016-103-FFP D34 can supply 750 amperes for half a minute in below freezing temperatures. 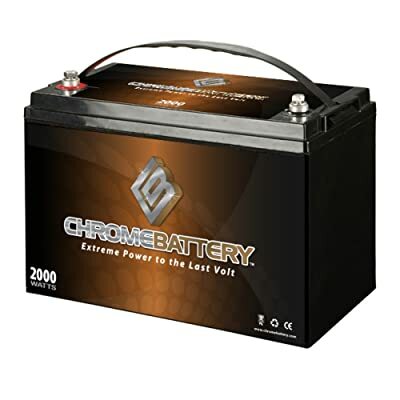 This allows the battery to be exceptionally useful when you want to start the RV in extreme weathers. It’s quite versatile so you can mount the battery virtually every position imaginable. The 8016-103-FFP D34 work well as a starting battery yet it’s not lacking being used as a deep cycle battery. Weight at 43.5 Lbs, it’s lighter than most product though not exactly the lightest of all. The battery reserve capacity allows it to function for two whole hours in continuous uses. Its durability is very high with more than fifteen times vibration resistance compared to average batteries. Due to the presence of innovative SpiralCell, you will have an efficient power source using the 8016-103-FFP D34 battery for your RV. Built with alloy plates and fiberglass separators, the 12V 110AH T8 SLA is a robust battery with high endurance. The T8 terminal style ensures that the battery delivers a higher performance to the user. Nicely done cell compression combine with glass mat technology permit superb vibration resistance in less than ideal situations. It’s a maintenance-free battery so all you have to do cleanse it once in a while. The12V 110AH T8 SLA is backed by a 1.5-year warranty and a 2-month refund guarantee.